The wildest set of Columbia Blacktail I have had. This is what is called a"cactus" buck. Just hundreds of small points going over halfway out the main beam.These were taken on the Washington coast years ago and were cut off an old mount. 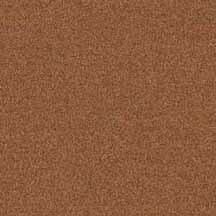 A few VERY minor hairlines. Will make an impressive mount ( again). Clean 4x4 with an estimated inside spread of 18" and an outside spread of 24" Must see and heft these. Great mass. Rough score of 139"+.No chews, chips, breaks, or repairs. 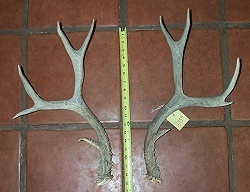 Another great set of "cactus" buck Blacktail antlers . 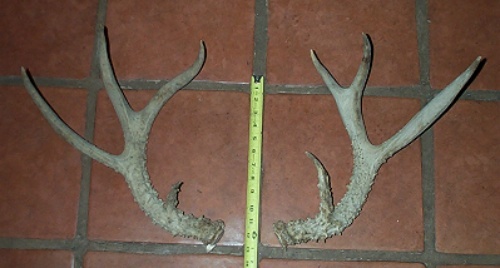 These are an older set of cutoff 5x5 coastal antlers , so they have faded some, but these are in perfect condition with NO cracks, chews, breaks, chips, or repairs. Hundreds of little points running up past the brow tines. These are heavy and weigh approximately 3 lbs . Estimated outside spread was 25" .